I've used Sandra Betzina's method of underlining and finishing the seam allowances at the same time. This gives the pants a couture look. And as I said in this post, I've applied everything I discovered by peaking inside men's trousers. Facing of fly extension is cut from lining, on the bias and on the double and there is a buttonhole to secure the extension to the pants. The button (you can't see it in the picture) is sewn to the bias binding of the fly facing. Pocket bags are bound too. "Fake" (meaning there is no pocket bag) double welt pocket, secured with buttonhole and button. I've used Debbie Cook tutorial for this and I absolutely loved it! For the fly front, I usually follow Sandra Betzina's method. This time I followed Sigrid's tutorial and I liked it a lot. And this is the pre-made waist band. Remember the yuck Christian Dior logo? I hated it and covered it with a silvery bray pre-folded satin bias ribbon. And I finally managed to order labels!!! Do you like them? I got 144 for 7.95 sterling pounds. Not bad, isn't it? Read my detailed PR review here. There seems to be a problem with my feeds so those of you subscribing to my blog haven't received the feed with my post yesterday. I love the high waist and wanted to keep it unwrinkled and nice-looking, therefore I've decided to add a sturdier fusible (fusibles that I buy here in notion shops don't have a name or code or whatever, therefore you've got a photo below) and boning (for that I've added a center seam to the facing instead of cutting it on the fold). I chose that type of boning that you can sew through, because it is practical, flexible, it keeps its shape and it doesn't need any end treatment, because it doesn't poke. Since I've read this tutorial (two years ago), I've only used this method! For more details, read my PR review of the pattern. I've just finished Vogue 8425 (the high-waisted skirt) in a black Italian suiting (a mix of wool, rayon and elasthane). I will take pictures tonight and hopefully post them tomorrow, together with a full review. 1) The fly extension has a different shape, flaring to the upper part (the one connecting to the waistband). This extension also has a buttonhole, and there is a button for it, on the inside of the pants. This secures the pants. 2) The fly extension facing is cut on the bias and on the double. It also extends over the waistband facing. 3) The fly facing is finished with foldover bias tape. 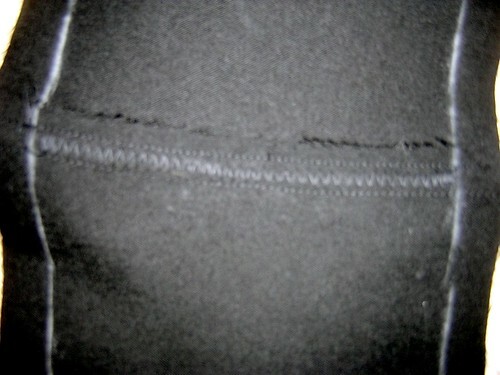 7) There is a welt pocket in the back and I intend to copy this detail. I will make a fake pocket (welt but no pocket bags) as I don't really need a pocket in the back, nor do I need the supplementary bulk. It's interesting that in this pair of pants, one of the welt pocket lips (do you call them that? I can't remember the word) is wider than the other. I've never seen this before. 8) There is a special band reinforcing the hem and giving it weight. That I already knew and used for my pants. I've hesitated a lot before deciding if to underline or not the pants with organza. I've received great advice on the Artisan's Square board, I can't thank enough everybody for being so helpful and supportive. Why did I hesitate? I would like to underline to minimize wrinkling and to give my pants that expensive look. However, I don't want the pants to become less drapey. Also, I'm not sure what kind of organza I have. I don't think it's silk, because it melts when burning with a lighter. I don't think it's poly either, because it doesn't scratch the skin a bit. 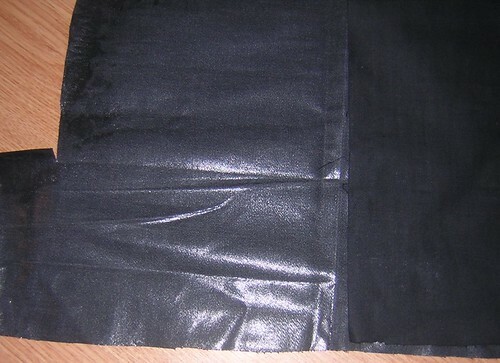 You can see it in the photo below, it's very-very silky to the touch, smooth, sheer and a bit shiny. Could it be viscose? I really don't know... I think I will give it a try because I put it together with my fashion fabric and it didn't seem to change the drape. Speaking of polyester, have you read this post on Diva Ann's blog? So, here you are: fashion fabric - another great Italian suiting (wool and viscose), mystery organza, pre-made waist band (the one with the yuck Christian Dior logo), the other waist band (Petersham-like), pre-folded bias tape, tape for the hem of the pants, a strip of bias canvas and cross-grain tape in case I decide I want to make my own waist band, men's trousers hooks (there are two types, one that you sew in and one with tiny little things that go in and are then bent - cant' explain it better than this, sorry :(), buttons. The sleeve without cap ease... It looks pretty good and rounded to me and I can tell you it feels perfectly comfortable. I have plenty of moving room. As I already said in this post, I used techniques described in Marcy Tilton in her "Inside an Armani jacket" article (the link is in the post mentioned above). 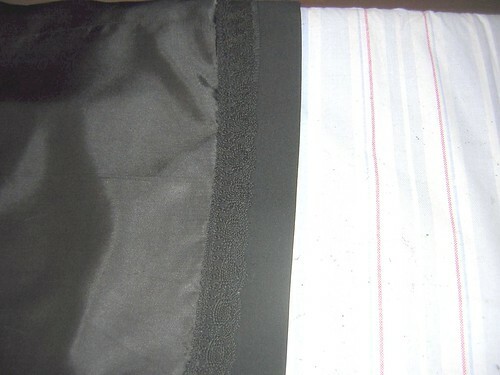 Below is a picture of the floating chest piece (attached to the roll line with a bias strip, catchstitched). I cut my own sleeve head, copying the sleeve pattern between the two notches. The sleeve head is made out of polar fleece (very good for that) and is about 2 inches wide. For bagging the lining, I've used this tutorial on Kathleen Fasanella's site and obtained a perfect, clean finish without any handstitching. This method is great and I'll keep using it. I also did my best to match the check on the houndstooth at the seams and at the sleeve (having no cap ease helps). It was very difficult, because this houndstooth (from TimmelFabrics, as my SWAP second prize) is a mix of silk and flax and it distorts very easily. More about this jacket in my PR review. The shoes are new... A (bit of an) early present for my birthday, from my husband. Yes, you can have a free Vogue pattern or if you buy several, the highest priced pattern will be free. Of course, you still have to pay the shipping. The offer is valid worldwide and excludes designer patterns. The offer is made by Vogue Patterns and you can go here to take advantage of it. 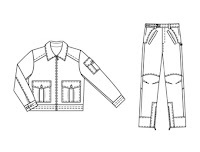 Want to design a nice-looking storyboard for planning a wardrobe? Want to see how a pattern would look in your actual fabric? Storyboard tute on Taking back the quality of my life blog. Here's my method, which I like because it seems bulkless to me. 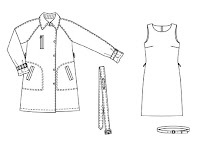 It is a combination of several methods, some picked many years ago from the Burda illustrated course, some from sewing tips in a French magazine. I think it was Marie Claire but I'm not sure, this was 20 years ago! First of all, my apologies because I forgot to take pictures at the beginning, therefore I must replace them with sketches. 1) If your pattern doesn't have a separate piece for the undercollar, make yourself one, by copying the upper collar and trimming 1/8 inches (3mm) all around. Sew the upper collar to the undercollar (my undercollar is cut on bias), stretching the trimmed undercollar to match the upper collar. Stop at the notches (marked with "stop here" on my drawing). Trim seam allowances if needed, turn, understitch and press. If you match the neckline seam on the uppercolar and undercollar, you will see that the uppercollar is bigger. Now fold that collar, still matching the neckline seams and put it around your neck. See now why the uppercollar is bigger? To adjust for the so called turn-of-cloth. The collar folds and rolls beautifully around your neck. 2) Sew the uppercollar to the facing (the collar's neckline seam to the facing neckline seam). 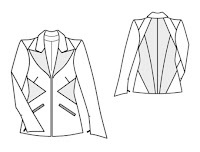 4) Sew the facings to the jacket. 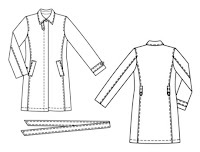 5) Now, fold your collar and put one seam allowance of the uppercollar and one seam allowance of the undercollar together (the other two seam allowances are inside the collar). 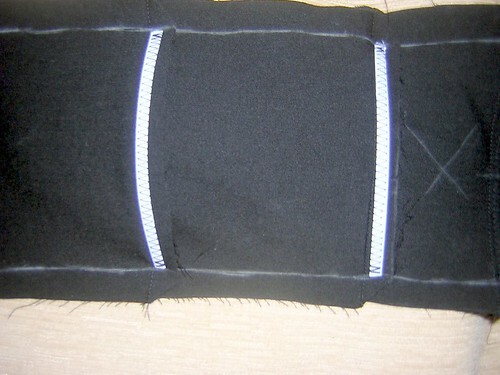 Sew those seam allowances together, either by hand or by machine (using a zipper foot in this case). 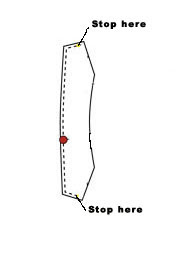 Turn and press. Isn't it beautiful? Light and without bulk. I taped the lapel roll line with fusible tape, about 1.5 cm shorter than the roll line. 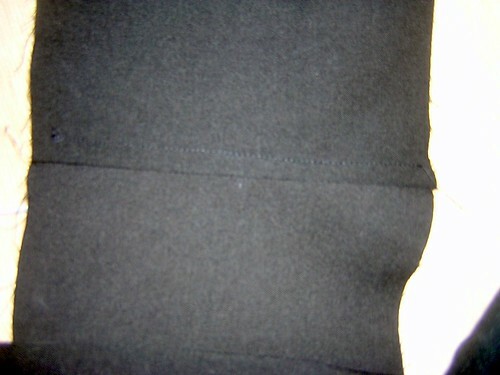 The majority of the ease is in the middle third of the lapel line and the easing is done by steaming. I stabilised the center front edges with 5/8 (1.6 cm) tape which is actually a lining selvedge. 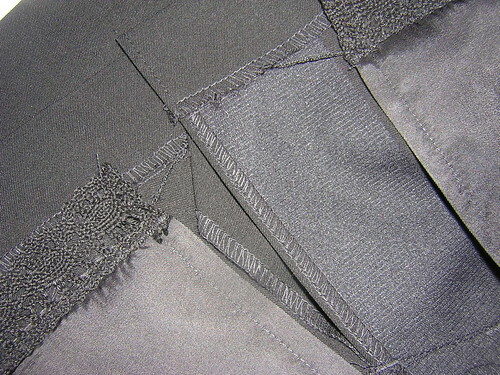 Tha tape was sewn with a basting stitch, without stretching. 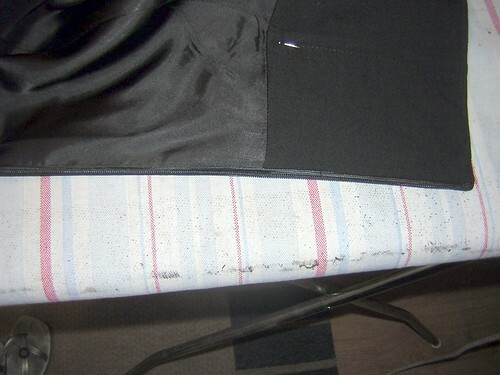 The tape is clipped at roll point, to allow the lapel to roll. The armhole is stabilised with 1/4 (6 mm) twill tape - the tape is slightly stretched while sewn, thus forcing the armhole to "hug" the body - and at the shoulder, the seam allowance is pressed open for 2 inches (one on both sides of the shoulder point). I'm also planning to attach a floating chest piece made out of canvas cut on the bias and a wigan strip (also cut on the bias) at the sleeve hem. Stay put for the completed jacket and more inside pictures. 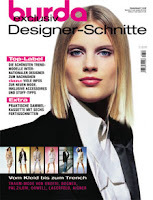 As a bonus for subscribing to Burda WOF - Romanian version, I got the Burda supplement containing designer patterns (Burda Exclusiv Designer-Schnitte). What's really nice is that the patterns come separately in a cardboard folder and they are ready to cut/trace, just like Big4 patterns or other patterns and not like the patterns in Burda WOF, where several different patterns are printed on the same sheet.